Adventure in the North Cascades but no actual Dorado Needle content. The route to Eldorado is in good shape everywhere. Getting to Klawatti involves navigating around crevasses but is otherwise straightforward. While the climb was listed as Dorado Needle, our objectives were flexible. 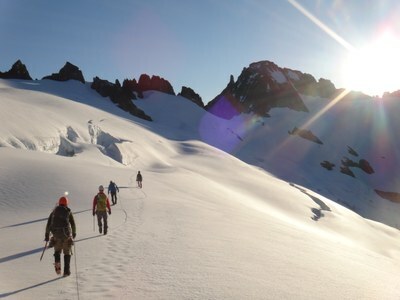 We chose Eldorado Peak, Dorado Needle, and Klawatti Peak as targets for our weekend in the North Cascades. In the end we only stood on the summit of Eldorado but the outing was otherwise successful. Our party of six started from the Eldorado trailhead and headed up to the east ridge of Eldorado. We didn't hit snow until the ridge between the Eldorado Creek and Roush Creek drainages and the gully between them was dry. There were low clouds with occasional periods of almost zero visibility. We climbed Eldorado without incident, placing a couple pickets on the final ridge to the summit. We planned to camp near Dorado Needle but decided not to navigate the glaciers with the intermittent low visibility and settled in at the Eldorado high camp. We awoke to clear skies and headed out across the Inspiration glacier. We decided that we only had time for one peak and chose Klawatti. At the base of the southwest buttress we belayed one climber up 40 feet to where he could see some mid-fifth class rock to surmount before getting to easier climbing. We were in mountaineering boots and decided against continuing. We looked at other possible climbing routes but decided to head home. By this time the sun had warmed the snow and the return trip was considerably more work as we took a higher, more indirect route back and made many little postholes. On the long descent from camp one of the climbers took a serious tumble in the boulder field. We were fortunate that he was able to continue and the situation became a careful self-extraction rather than call for a rescue. Details of the incident have been provided to the Safety Committee.